Former President George H.W. Bush has issued another statement after a second actress alleged that he groped her at an event. The statement says that because the former president is confined to a wheelchair, his arm would fall on the lower waist of people when they would pose for pictures. In an effort to "put people at ease," Bush would "routinely tell the same joke." While some people have found these encounters to be innocent, others did not, and for that, the president said that he apologizes. "At age 93, President Bush has been confined to a wheelchair for roughly five years, so his arm falls on the lower waist of people with whom he takes pictures. To try to put people at ease, the president routinely tells the same joke - and on occasion, he has patted women's rears in what he intended to be a good-natured manner. Some have seen it as innocent; others clearly view it as inappropriate. To anyone he has offended, President Bush apologizes most sincerely." 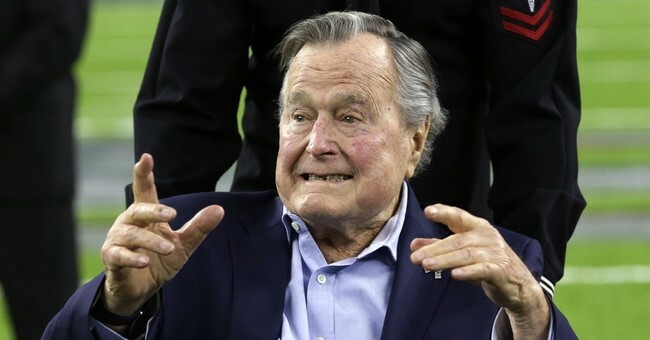 According to the website Deadspin, Bush would reportedly tell people that his favorite magician was "David Cop-a-feel," before feeling their rear ends during pictures. Deadspin discovered two tweets from 2014 where people said that Bush made the "cop-a-feel" joke at an event. Bush was first accused of inappropriate behavior by actress Heather Lind in a since-deleted Instagram post.